What began as a songwriting experiment between two estranged NJ high school friends became a movement when vocalists/guitarists Jim Gaven and Dave Sanchez realized they had the same musical hopes and aspirations. Combining their desire to bring joy to the masses, they entered the studio in May 2006 with producers Shep & Kenny (Head Automatica, Mandy Moore, Bayside) and cut their debut EP titled “Timing is Everything”. 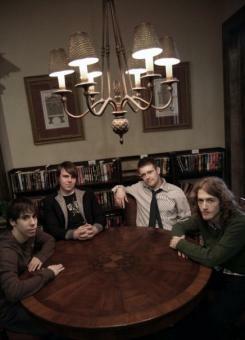 Postmark Twain quickly received an overwhelming response, meeting with three major labels, topping the unsigned charts on Purevolume.com, performing on Billboard.comand being named one of the top 40 unsigned bands in the nation by The Daily Chorus. Postmark Twain’s amazing story is about to begin its second chapter. With the addition of new members Matthew Michael and Paul Marmo, the band entered the studio with producer Rob Freeman (Cobra Starship, Hidden in Plain View, Hit the Lights) in December 2007 to create their follow up EP, “Cause and Effect”: a five song voyage about letting go, starting over, and moving .. a year of solid songwriting, full band rehearsals, and the finishing touches of mastering engineer Michael Fossenkemper (Matisyahu, Over It, The Spill Canvas), Postmark Twain is looking forward with confidence, ready to gain new fans and expand its influence to anyone and everyone along the way.